When Jean and Nick asked if I would be willing to drive to Aspen for their Maroon Bells engagement, there was only one answer: HECK YES. Even as a Colorado native, I had never been to the Maroon Bells. For those that don’t know, this stunning location just outside of Aspen is the most photographed location in all of Colorado. If you’ve seen a “stock photo” of Colorado, it’s most likely from this stunning lake. On a Friday morning, I left my house fairly early to head over Independence pass into Aspen for Jean and Nick’s Maroon Bells engagement session. I took my time, taking in the views through Leadville, over the pass, and into the town its self. When I took the right curve where the peaks come into view – I nearly was in tears. It was truly a sight to see, and a sight that I had been waiting a long time to experience. 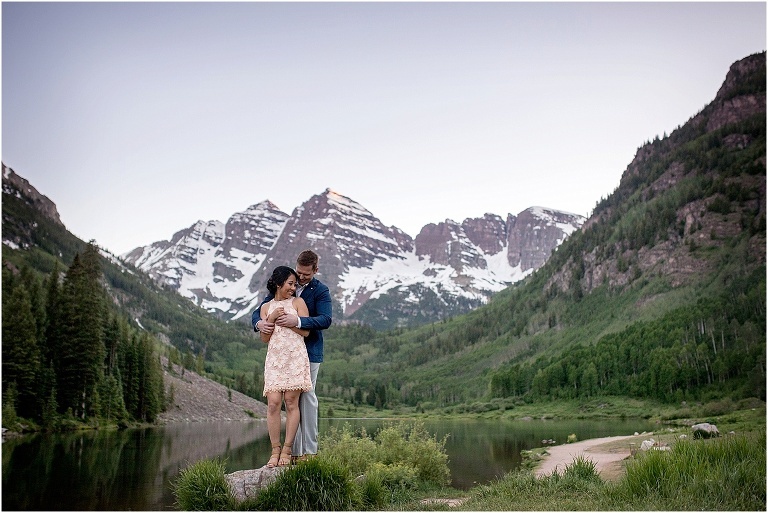 I met Jean and Nick up at the lake, where we took the Lake loop to get a few different areas of the surrounding wilderness for their Maroon bells engagement. As much as they would have loved to have done a full hiking session, Nick was recovering from a motorcycle accident that unfortunately made that not possible for this moment in time. (I would love to go hiking in that area at some point – hint hint 😉 ). We started taking the loop, getting the greenery as well as some stunning red rock formations in the background. As the sun started to hit the horizon off in the distance, we headed back to Maroon Lake for some images just as dusk approached. The mountains only alpenglow (that “bright red” look) at sunrise, but the dusk light was also quite magical and simply stunning. I’m so excited to celebrate with the two of you this August for your Keystone wedding! Thank you for adventuring into the wilderness with me for your Maroon Bells engagement! © 2019 Colorado Mountain Wedding Photographer|ProPhoto Photographer Template|Design by Northfolk & Co.